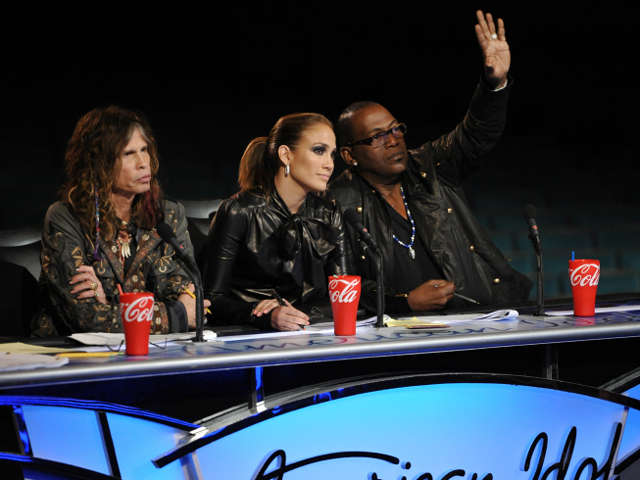 (CBS) This is a new era for "American Idol." For the first time in its 11-year history, it has a genuine rival in "The Voice." It isn't just that "The Voice" managed to garner more than 37 million viewers after the Super Bowl, 17.7 million of whom came back again for Monday's two-hour auditions. It's that the NBC managed to offer amusing - and far less forced - interaction between its judges, as well as singers who could actually, well, sing. So here we were last night entering the Hollywood round of "Idol" with the complacent words of "Idol"'s executive producer Nigel Lythgoe offering tinnitus to our ears. "The Voice" was gimmicky, he said. Might I help with a translation from the English? He's scared. Especially with the sight of Steven Tyler, who seems intent on being an anachronism who wouldn't even get a part in "Spinal Tap." Some of these Hollywood performers we've already seen in a little close-up. Others seem to have been deliberately kept from view. Johnny Keyser opened the show with chiseled precision and the slightly lascivious stares of Jennifer Lopez. Hee Jun Huan was having trouble getting over the fact that everyone in Hollywood was so pretty. Yes, even the males. Silly boy. It's especially the males who are pretty in Hollywood. But at this stage, it's hard to keep up with all the characters - 309 have been admitted to Hollywood's pearly gates. Half will be sent back to the backwoods from which they came. The difficulties for many are obvious. There is no accompaniment. There is no music. All they have are their voices. When was the last time Britney Spears had to face this kind of challenge? So look at some of the names that got through and they will still mean little: Lauren Gray, Reed Grimm, Jen Hirsh, Brittany Kerr Elise Testone. Do any of these sound like stars? What about Creighton Fraker? Will anyone be able to spell Creighton Fraker? Will anyone want to wear that on a T-shirt? Are you a "Fraker Shaker"? Consider, though, Travis Orlando, a man with a painful story who, in his words, has to "go back to nothing" after being eliminated. And this for the second year running at the very same stage. That's a lot of nothing to put up with. Consider, too, Jenni Schick. In the first auditions, she got a kiss - Yes! On the lips! - from Tyler. This time around, all his lips were expressing was: "You're going home." "Another day, another dollar. Another man to give out a holler," was Tyler's considered view as he ambled from a limousine on the second day of Hollywood amusement. Once you've made it and stayed there for a few years, everything seems so simple, so glib. Adam Brock simply tried to please Jennifer Lopez. He sang Marc Cohn's "Walking in Memphis" - a song she'd asked for. It was a very earthy version, too, one that found favor with the judges. Then we had Jane Carrey, daughter of Jim. She offered a revival of Creedence Clearwater. Sadly, before we could even take it in, she was looking out the back door. She was merely placed with others in the front row of two. "Front row, it's the end of the line," announced Randy Jackson. That was it. It doesn't matter if your Dad's a star. One day you're in, the next day you're out, as Heidi Klum would have it. Carrey called her Dad. He told her about all the rejection he'd experienced. Jane cried. Would she ever be back to face the spotlight again? Shannon Magrane, daughter of a former major league pitcher, kept her momentum intact. But then there was David Leathers Jr., a ladies man who projected a ladies song: Celine Dion's "Because You Loved Me." "I have ties that are older than you are," said Tyler. Ties to sanity? Ties to fame? Surely not ties to the national anthem. Leathers smoothed his way to the next round. But, at heart, Hollywood really isn't so glamorous. The way this show was edited, these performers only had a few seconds to impress or their tears would hit the road. But we needed drama. Real Hollywood drama. This is "American Idol." And "Idol" is slipping. So, like any soap opera, it needed a true cliffhanger. There was no JR to get shot. So what could be concocted to keep viewers on the edge of their buttocks? Well, here was Symone Zaire Black. She's 16. She has, in her words, a Stage Dad. She sang "Sitting on the Dock of the Bay". She chatted with Randy Jackson. And then she fell off the stage. All we know is that Ryan Seacrest called for medical assistance. Will she survive? Will she ever sing again? Surely you have to watch again. Surely that's precisely what Lythgoe and his fearful production team want you to do. It's not a gimmick, you understand. Drama's different.